The Witherspoon-Jackson community, centered around Witherspoon Street, comprised the heart of Princeton’s African-American community during the 19th century. Following the end of the American Revolution, the black community in Princeton grew as black slaves who fought in the Revolution gained their freedom and settled locally. By 1804, Witherspoon Street, the largest street perpendicular to Nassau Street, had acquired the name “African Lane” or “Guinea Lane” because of its considerable black population. The Witherspoon-Jackson neighborhood, centered around Witherspoon Street, expanded in the early 19th century to include Hulfish, Quarry, John, McLean, and Green Street. Beginning in 1807, the nearby Princeton Cemetery designated a “colored section” as a resting place for black residents. Tanneries and slaughterhouses also dotted the so-called African Lane, which made the area “an especially pungent part of town.” As the black community grew larger, the number of black businesses and homes increased, and churches and schools were established. In the first half of the century, the majority of Princeton's black population worked as farmers, domestic servants, college servants, cooks, washerwomen, and maids. The mid-19th century gave rise to black entrepreneurs who owned restaurants and provided other services. 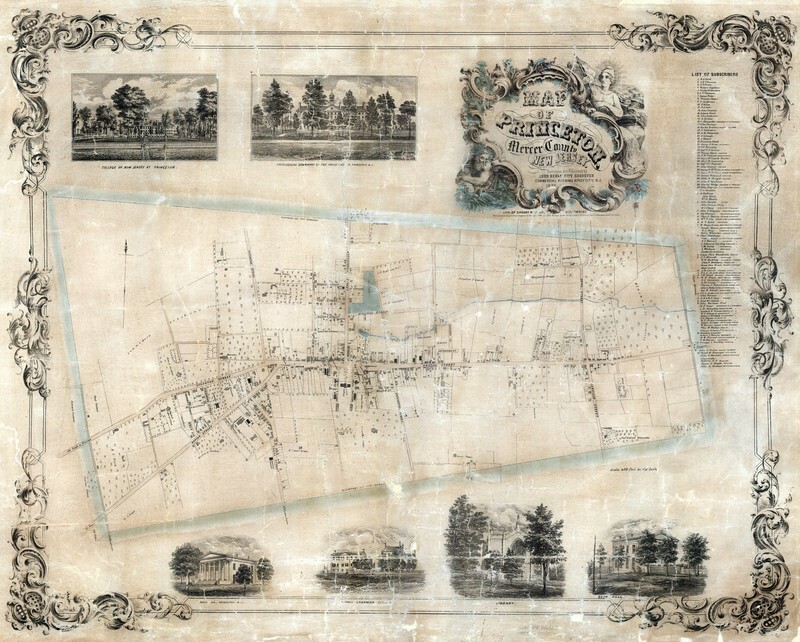 A map showing the town of Princeton in 1852. At the turn of the 19th century, Princeton had a considerable enslaved population. In the 1800 Federal Census, 1,564 and 1,863 enslaved people lived and worked in Middlesex and Somerset counties respectively, alongside only 263 and 175 free black people. This meant that the vast majority of the black population in the area—85.6% in Middlesex County and 91.4% in Somerset County—was enslaved. By 1810, the percentage of the enslaved black population had fallen to 66.1% in Middlesex and 86.2% in Somerset. This decrease can be attributed to New Jersey's gradual emancipation law, “An Act for Gradual Abolition of Slavery,” passed in February 1804. The act stipulated that children born to enslaved women after July 4, 1804, would be free—but only after serving long "apprenticeships" to their masters. Heated debates over the 1804 law took place across the state, including at Nassau Hall on the Princeton campus. But by 1820, the percentage of enslaved people among the black population had fallen to less than half in both Middlesex and Somerset counties—49.4% and 43%. By 1830, the percentage of bondspeople among the black population had fallen to 14.5% in Middlesex and 19.4% in Somerset. After the formation of Mercer County in 1838, the census record for Princeton become more precise. Slavery continued on a limited scale, but by 1840 the majority of slaves in New Jersey had been freed. Still, Princeton residents owned twelve slaves that year, surpassing all principal towns in New Jersey. These were the last slaves to be recorded in Princeton. Record of slaves owned in Princeton from the 1840 Federal Census. During John Witherspoon's presidency at the start of the American Revolution, the First Presbyterian Church of Princeton on Nassau Street welcomed a small black community for worship. President Witherspoon was an esteemed leader of the Presbyterian Church and encouraged Princeton’s white religious community to be inclusive of black congregants. During services, white congregants sat in the sanctuary while free and enslaved African Americans sat in the balcony. The church offered baptisms and wedding services for black people, regardless of their legal status as slave or free. In 1840, the church membership rolls listed about ninety-two black worshippers. In July 1835, a fire burned down the First Presbyterian Church. During the rebuilding process—from 1836 to 1837—around eighty black worshippers began to meet separately on Witherspoon Street. During this time, a committee at First Presbyterian was formed to decide whether or not the black members would be allowed to return to the church when it was rebuilt. In September 1840, Colonel John Lowery, an elder of the First Presbyterian Church, granted permission for black congregants to hold a separate communion service at their own church. Several years later, this church became “The First Presbyterian Church of Colour of Princeton," shortly after renamed Witherspoon Street Presbyterian Church. Located at the heart of Princeton's black neighborhood, the Witherspoon Street Presbyterian Church became the major spiritual and political refuge for the black community, where vibrant discussions took place about the colonization movement, fugitive slave laws, and reforms to improve the lives of community members. Anna Bustill-Smith described the church during this period as “most flourishing." By the 1850s, Sunday schools for black children provided religious education and promoted literacy. The “Mt. Pisgah” African Methodist Episcopal Church, established in 1836 on Witherspoon Street, also fostered a strong black religious community. It offered Sunday schools, assistance for fugitive slaves, and advocated for legal and voting rights for black Princeton residents. An 1835 article about the Princeton First Presbyterian Church fire published in the Commercial Advertiser. In 1858, the Witherspoon Street School—the first exclusively black school in Princeton—was established by former slave and missionary Betsey Stockton, with the help of black Princeton entrepreneur Anthony Simmons. Betsey Stockton taught at the school until her death, and is remembered as a “good educator for the colored boys and girls of Princeton.” Prior to its establishment, educational opportunities for black children were very limited aside from the Sunday school offered by the Witherspoon Street Church. Many children, both black and white, did not attend school beyond elementary school, and New Jersey public schools were not organized until 1858. 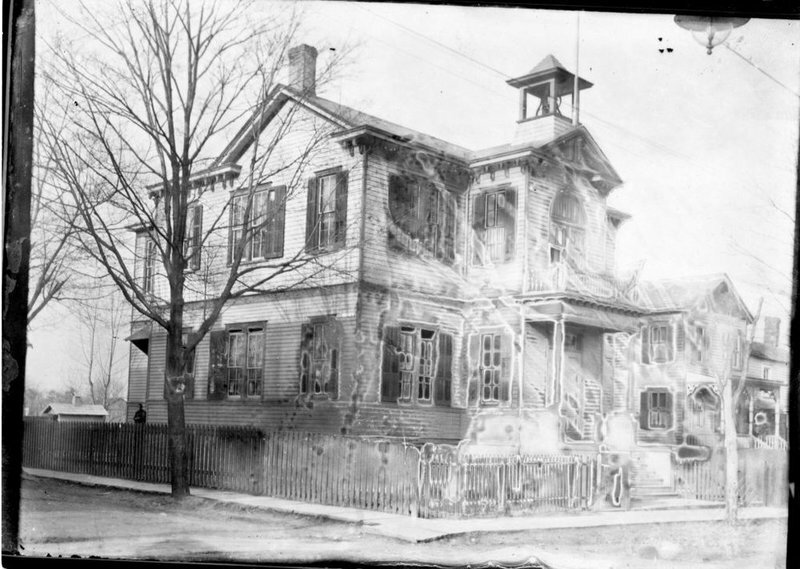 At the time of its establishment the Witherspoon Street School was small, with sixty-eight students enrolled in its primary and higher classes. It was equipped with a playground for younger pupils and comfortably furnished. The school curriculum was adapted from the standard set by the Princeton school district. Still, the school struggled with a lack of financial and academic resources and fell short of the education provided by white schools. Black teachers often lacked training and received less pay than their white colleagues. Like the Presbyterian Church, the Witherspoon Street School provided a center for activities and a gathering place for the black community. When classes were not in session, the school was used to host dances and other events that black townspeople frequented. Both the Witherspoon Street Presbyterian Church and Mt. Pisgah AME Church supported of the school and sponsored scholar banquets for black students who excelled at their studies. The former Witherspoon School for Colored Children, on the corner of Witherspoon and Maclean Streets. Princeton’s first official jail was constructed in 1823, underneath a council chamber and across from the City Hotel on Nassau Street. The council chamber was used to hold important meetings, such as gatherings of the local colonization society chapter and the town's Bible Society. In the 1820s, it hosted a night school and later a Sunday school. 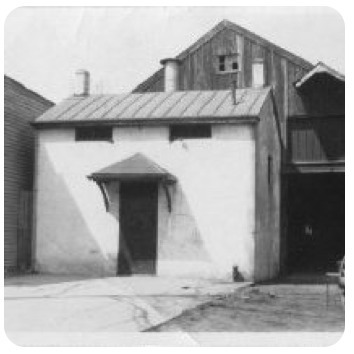 In 1840, the township erected a two-story stone jail on Hulfish Street. Also called “The Jug,” the borough jail consisted of two cells on the ground floor and one large room on the second floor which was used as to house indigent vagrants. This jail, built at the center of Princeton’s black neighborhood, was intended for black residents who committed crimes—commonly petty offenses such as drunkenness. The conditions inside the jail were extremely poor, with no heat during the cold New Jersey winters, and poor ventilation. Since the jail was so shoddily constructed, escapes were commonplace. The jail at the corner of Hulfish and Palmer Square West. "A Visit to the Colored People of Princeton"
On May 26, 1855, Ann Maria Davison—a Louisiana resident born in New Jersey—visited Princeton’s black neighborhood and described her observations in an account titled “A Visit to the Colored People of Princeton.” Davsion was born in New Jersey, but lived in Louisiana near her daughter and son-in-law's plantation outside of New Orleans for more than forty years. Despite her Southern connections, Davison was strongly antislavery, and in her diary often cited Bible passages to support her criticisms of the institution. Ann Maria Davison's account of her tour of Princeton's black neighborhood in 1855. “History,” Princeton Cemetery of Nassau Presbyterian Church, accessed 2 May 2016, http://nassauchurch.org/about/princetoncemetery/history/. Varnum Lansing Collins, Princeton Past and Present, (Princeton, NJ: Princeton University Press, 1931), 65. See also: John Frelinghuysen Hageman, History of Princeton and Its Institutions, Vol. 2, Ed. 2 (Philadelphia: J.B. Lippincott & Co., 1879), 14. Hageman, History of Princeton and Its Institutions, 14. 1800 Federal Census, accessed 28 April 2016, www.socialexplorer.com. 1810 Federal Census, accessed 28 April 2016, www.socialexplorer.com. 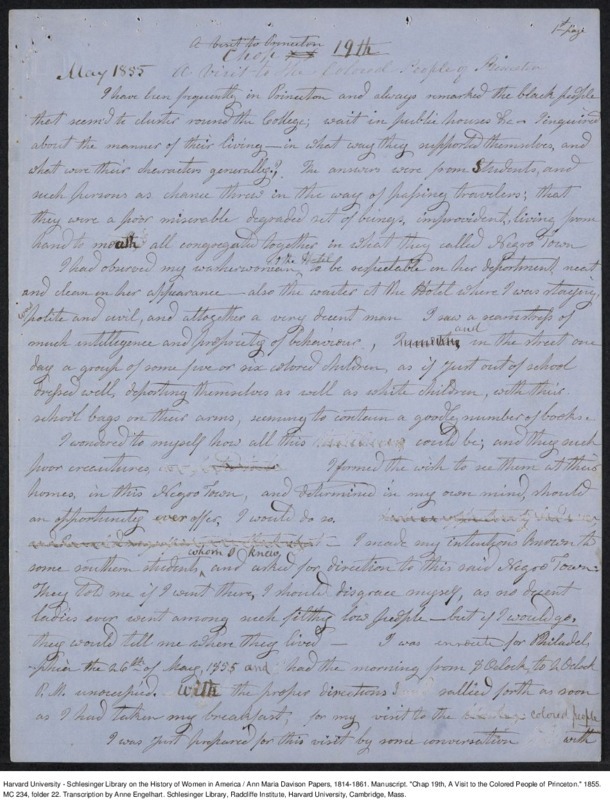 “An Act for the Gradual Abolition of Slavery," The New Jersey Digital Legal Library, accessed 29 April 2016, http://njlegallib.rutgers.edu/slavery/acts/A78.html. Jack Washington, The Long Journey Home: A Bicentennial History of the black Community of Princeton, New Jersey, 1776-1976, (Trenton, NJ: Africa World Press, Inc., 2005), 21. 1820 Federal Census, accessed 28 April 2016, www.socialexplorer.com. 1830 Federal Census, accessed accessed 28 April 2016, www.socialexplorer.com. 1840 Federal Census, accessed 28 April 2016, www.socialexplorer.com. Thomas J. Wertenbaker, Princeton 1746-1896 (Princeton, NJ: Princeton University Press,1946), 52. Daisy Sharp, “Remembering the trolley, the curfew, and Kid Green’s car,” Trenton Evening Times, 16 April 1976. Hageman, History of Princeton and Its Institutions, 15. 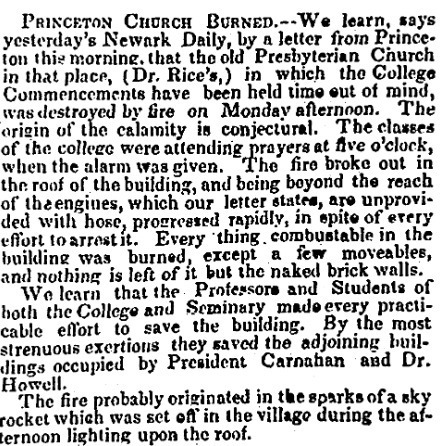 “Princeton Church Burned,” Commercial Advertiser, 10 July 1835. Washington, The Long Journey Home, 24. Anna Bustill-Smith, Reminiscences of Colored People of Princeton, N.J., 1800-1900, (Philadelphia: P.V. Baugh, 1913), 11. Washington, The Long Journey Home, 26. John Whiteclay Chambers, Cranbury: A New Jersey Town from the Colonial Era to the Present, (New Brunswick, NJ: Rutgers University Press, 2012), 66-67. Hageman, History of Princeton and Its Institutions, 121. Washington, The Long Journey Home, 98. Daisy Sharp, “Remembering the trolley, the curfew, and Kid Green’s car." Washington, The Long Journey Home, 103. Hageman, A History of Princeton and Its Institutions, 6. Ibid., 11. See also: "The Borough Jail," Newark Daily Advertiser, 28 September 1846. Hageman, A History of Princeton and Its Institutions, 36. See also: Randy Hobler and Jeanne Silvester, Princeton: On the Streets Where We Live (Princeton, NJ: 1990). Jack Washington, The Long Journey Home, 35. Ann Maria Davison, “A Visit to the Colored People of Princeton," Ann Maria Davison papers, Schlesinger Library, Radcliffe Institute for Advanced Study, Harvard University, accessed 2 February 2017, http://oasis.lib.harvard.edu/oasis/deliver/~sch00542.